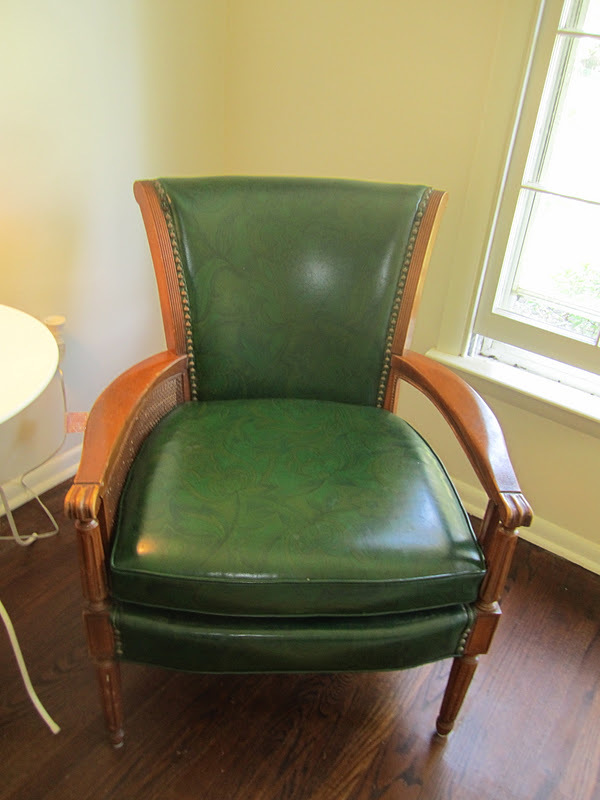 Swoon Style and Home: Farewell Green Pleather Chair! This baby has come a long way from how it looked when I bought it for $15 on Craigslist! This chair has been on my list of things to do pretty much since Day 1 in the new house. I finally got to it, and I won't lie, it was hard and painful and tedious work! 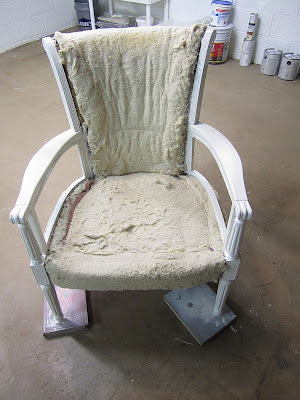 I was definitely intimidated by the whole process, as everything I have read about stripping and reupholstering chairs seemed fraught with warnings about how un-fun of a project it is! And I don't sew, so I was very nervous. But I figured I should just jump in and if it was an utter disaster, I'd be out just $15. 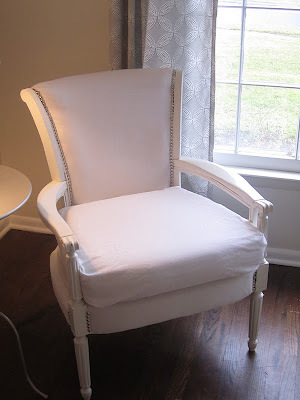 I certainly did not want to reinvent the wheel on this, so I read, printed, re-read and strictly followed the tutorial for reupholstering chairs on Little Green Notebook. In particular, I followed steps one, two, and three of her five-step process (steps four and five were about sewing the cushion so I skipped that and made my own way with my seam tape). If you're interested in redoing a chair, check out this tutorial. I followed it to the letter. Thank you Little Green Notebook! The first thing I did was strip the chair of the green pleather (step one of the Little Green Notebook tutorial). I used needle nosed pliers and all sizes of flat head screwdrivers. 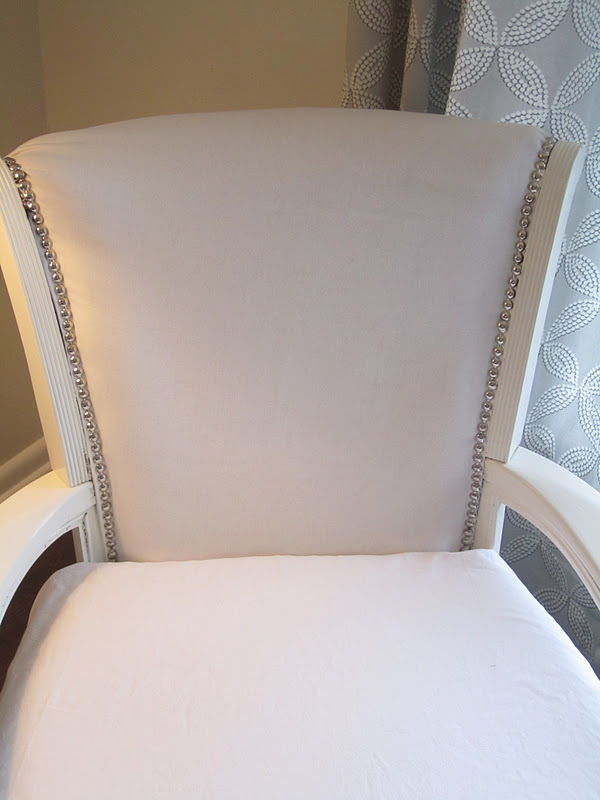 My chair was upholstered with nailheads and tacks, so it wasn't too difficult to get them all out. The key here is to go slowly and take pictures of everything, every angle as you go along (so you remember how to put it all back together when the time comes) and to save all the fabric pieces so you can cut the new fabric. I also saved all the batting. Step one is a very time-consuming process! It took me about two hours to do it. Next, I cut my fabric to size. I just put the green pleather on my new white cotton duck fabric and traced it like a pattern. Since I cut the fabric, I could throw away the green pleather. Next was Step Two - painting the frame. I chose Dover White (again.surprise.always.) for the wood. I followed the process I always follow when painting furniture: a coat of Zinsser oil-based primer and about three coats of Dover White by Sherwin Williams. I use the Pro Classic paint, which is perfect for furniture (I have it in semi-gloss and high-gloss finishes ... I much prefer the semi-gloss, but I used high gloss for this one). 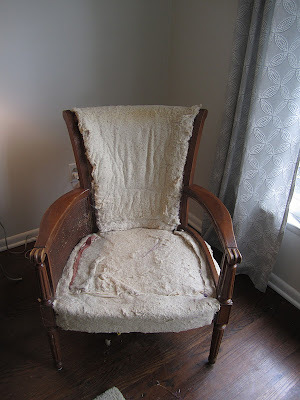 I did not go to the trouble of taking off the batting on the chair and just kind of painted around it. 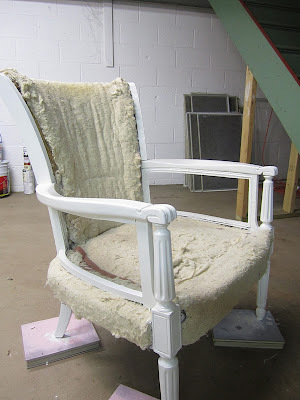 Before I painted, I cut the caning out of the one side of the chair -- you can see above that only one side had the caning. I much prefer the chair without it! Next up was Step Three - stapling the fabric onto the frame. This was the most nerve-wracking part of the process by a mile. Before I stapled, I put all of the pieces together, just so I knew where everything went. This helped a lot. I just used my staple gun to put everything in place and followed the pictures that I had taken. 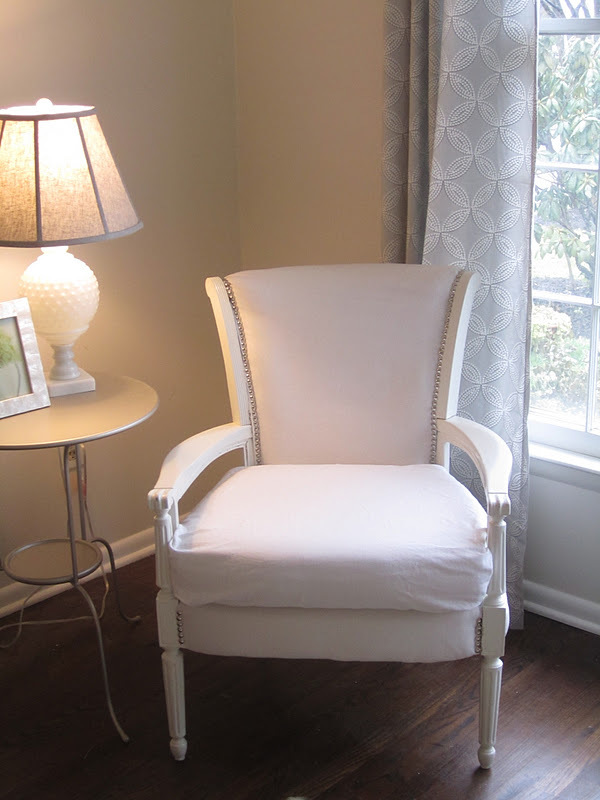 I also used nailhead trim that I purchased from Joann's. 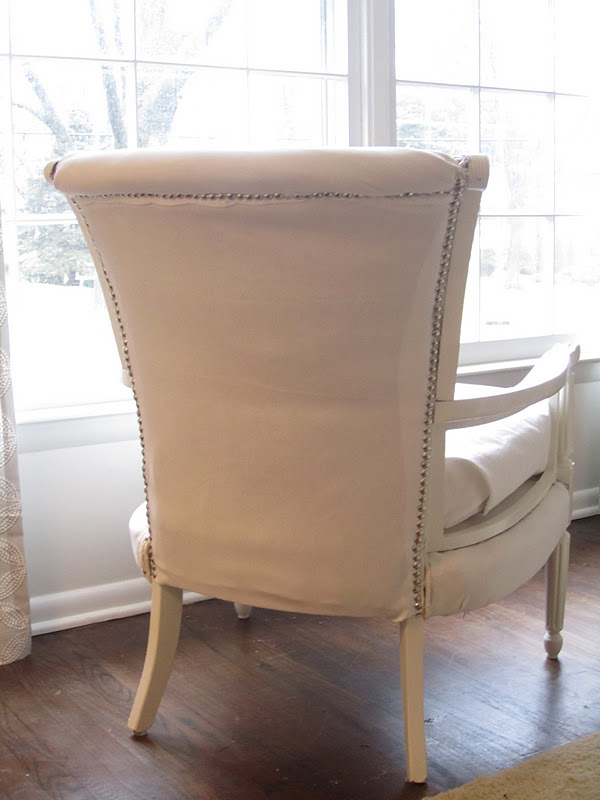 A combination of staples and nailheads worked like a charm. And here is the chair all put back together! 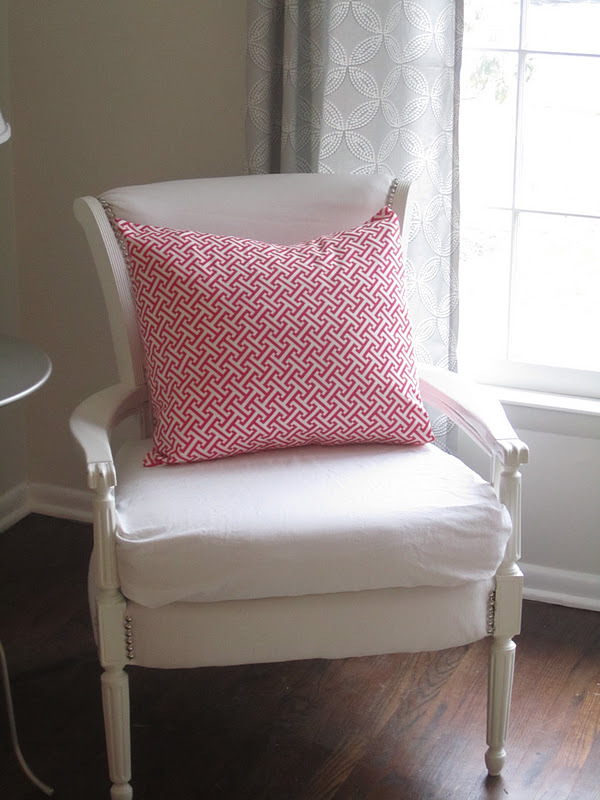 I had to cover the cushion with my cotton fabric, which was extra tricky because I used my no-sew seam tape and just ironed it on. I pretty much just wrapped the cushion like a present and ironed the tape directly on the cushion. And ... voila! The looks amazing!! Aren't you glad you spent that $15!!!! 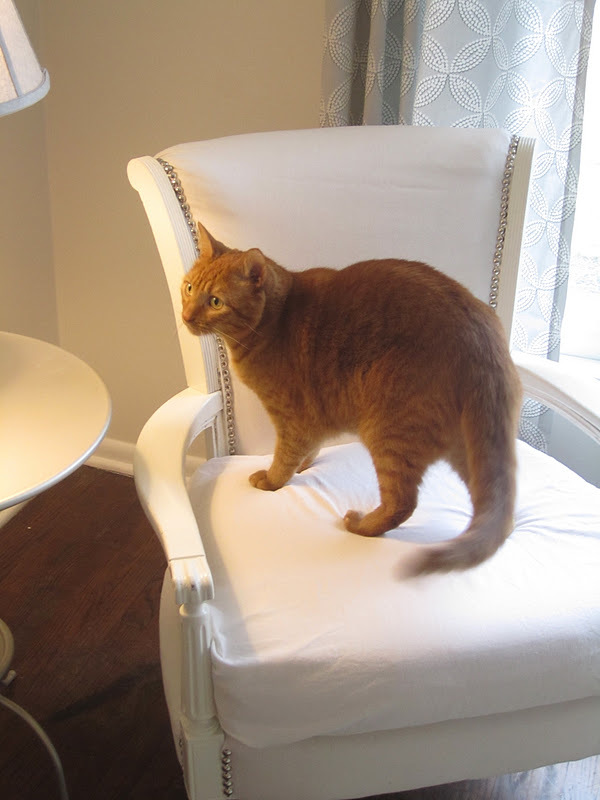 I have done reupholstering before, I helped a friend re-do all the chairs on her dining room set( 8 chairs), it was a doozy!! Her hubby even went out and purchased an air compressed staple gun, and that helped tremendously! But I did not want to see nailhead trim or a staple gun none too soon!!!! Gorgeous! 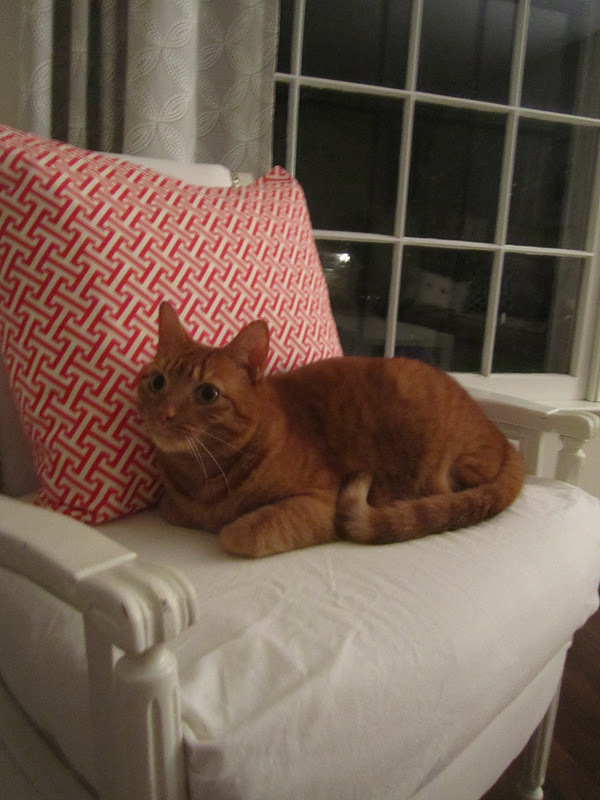 I love the coral pillow. You know I love that chair! It looks so so good!!! Thanks guys! Wow Noelle, that is serious commitment! But I'm with you: I am happy to have this one behind me. wow - this is a fabulous project - that chair looks so great now, Shanna. Shabby Apple. Live it. Learn it. Love it. DIY Chalkboard Menu - what's cookin?